Ready for a super simple Puerto Rican dish? Perfect for a cold winter day when heating up the kitchen oven keeps everyone toasty. 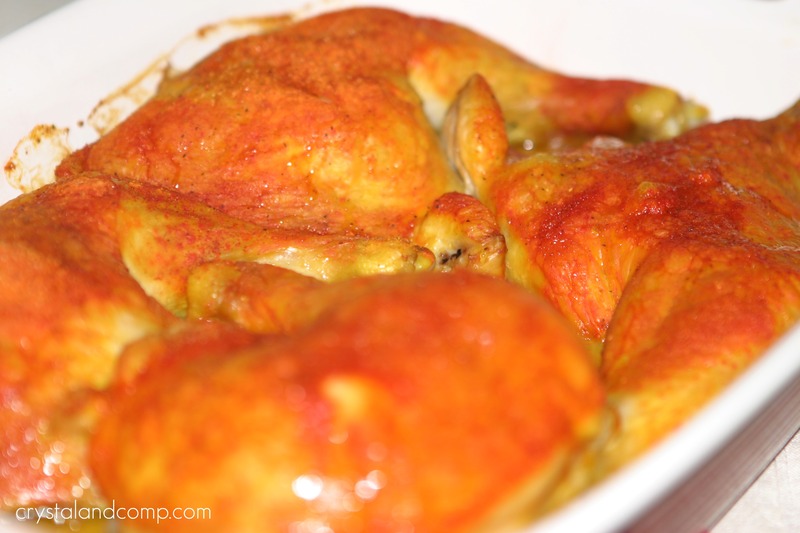 Place the chicken quarters in a 9×13 casserole dish. Chicken quarters are very inexpensive. I paid less than $3 for all the chicken in this dish. Generously sprinkle the tops of the chicken quarters with Sazon packets. 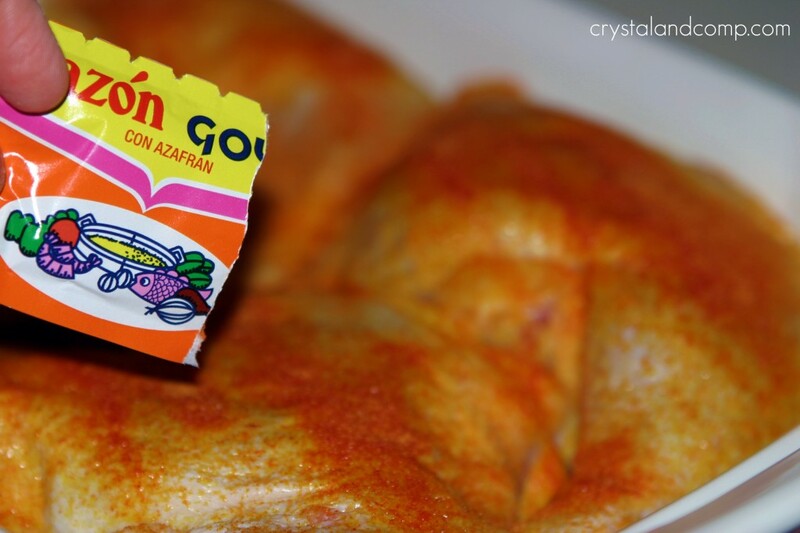 Sazon is a product made by Goya. You will find it on the Latin aisle of your grocery store. It comes in a box of 12 packets. Staple for Puerto Rican cooking. Sprinkle each chicken quarter with Adobo Seasoning Salt. Another Goya product and you’ll find it near the Sazon. Both of these products are also used in my Puerto Rican Stew, so you’ll now have two recipes to make using these products. Pop the casserole dish in a 350 degree oven, uncovered, for one hour for one hour and fifteen minutes. When it is done you will be able to cut into the chicken and the juice run clear. This is what it will look like when it comes out of the oven. For my family, I separate the thighs and the legs. Little kids like the legs and bigger kids and adults like the thighs. If you do not like the skin on the thighs, it comes off very easily once cooked. Plate it up and dinner is done. 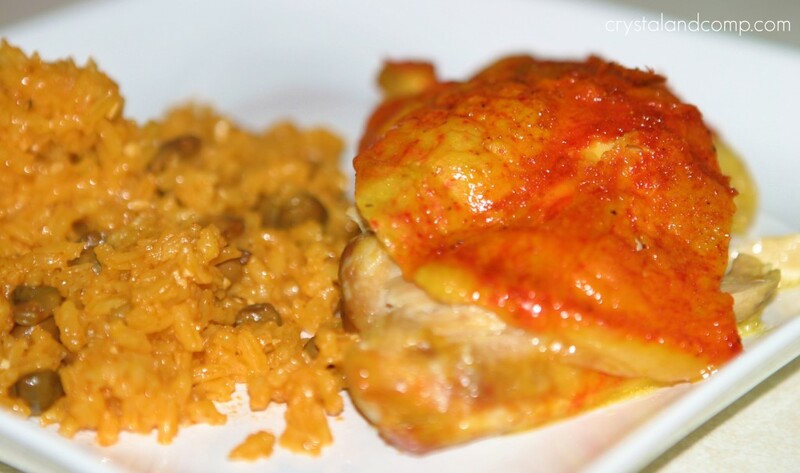 This chicken goes perfectly with Puerto Rican rice and a dinner salad. If you are a busy mom wanting to simplify dinner and eat a homemade meal together- freezer meal planning is what you need in your life! 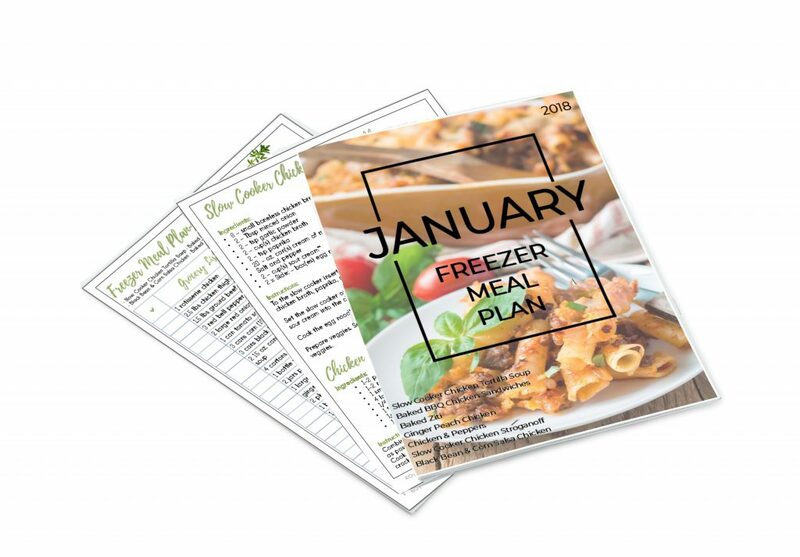 Our freezer meal plans offer seven delicious meals the entire family will love. Get the grocery list, assembly instructions and recipes for seven different meals in an instant download and start making dinnertime easier immediately! Everything can be assembled in less than an hour! Do you struggle with getting dinner on the table? Check out our meal planning kit! I think you will love it. We have a vertical kit and a horizontal kit. 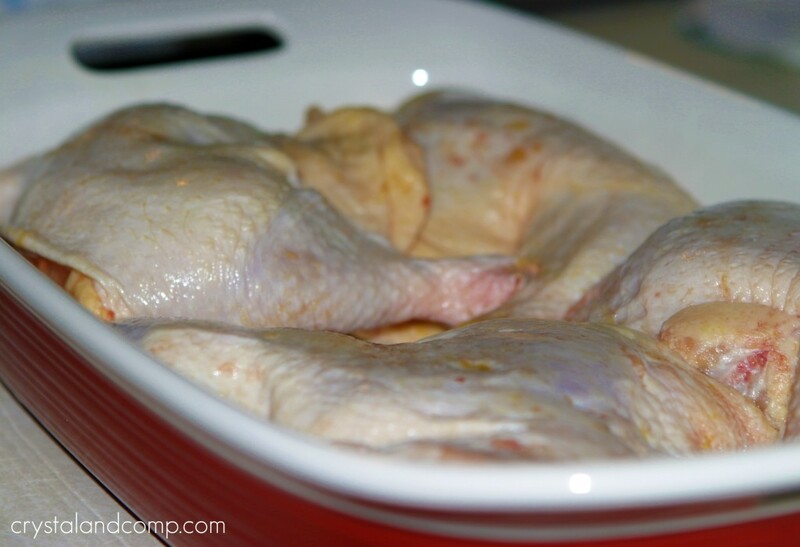 Place the chicken quarters in a 9x13 casserole dish. For my family, I separate the thighs and the legs. Little kids like the legs and bigger kids and adults like the thighs. If you do not like the skin on the thighs, it comes off very easily once cooked. 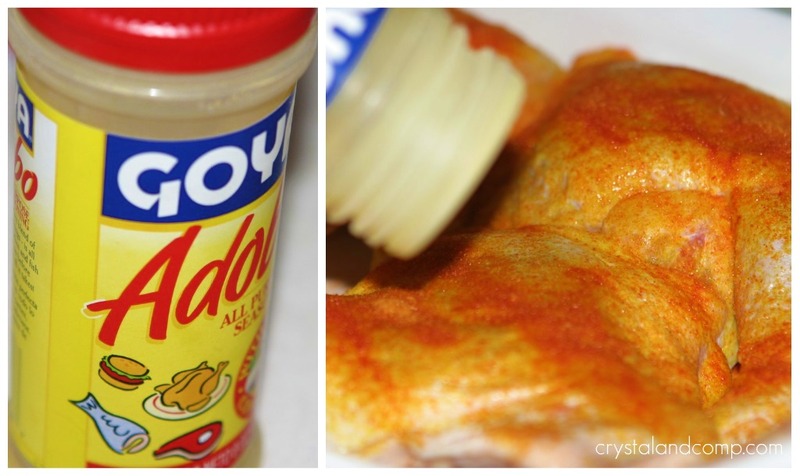 Sazon and Adobo are products made by Goya. You will find them on the Latin aisle of your grocery store. Sazon comes in a box of 12 packets. These two ingredients are staples for Puerto Rican cooking. Both of these products are also used in my Puerto Rican Stew, so you'll now have two recipes to make using these products. This is great– can’t wait to try it! I do something similar with Italian seasoning– just sprinkle them with rosemary, thyme, oregano, garlic, salt and pepper and sprinkle lightly some olive oil. Turns out real good. Sounds delish, John. Thanks for sharing. Yay, Julie! I am so glad you liked it and so glad you’ll make it again. A simple comfort food that works for any busy night. Forgot to rate the recipe before I hit submit! 5 STARS! It looks so yummy! Thanks for sharing. Love your space. This looks delish! I am a follower! Can you please post this at my Taste This Thursday party!? Crystal, that chicken has my name on it. This is a wonderful recipe that we will really enjoy! Hope you are having a great week end and thank you so much for sharing with Full Plate Thursday. I’m a little late to the party..but I have a question: does it matter which Sazon you use for this dish? I have the one with cilantro and annato but noticed that use the one with saffron. Yay, I am so glad you like it. It really is super easy to make. Thank you for this treasure of easy recipes. I have visited your site several times and I always skip the recipes because I hate cooking! My husband is Puerto Rican and always makes dinner. He is out of town and I’m in need of easy dinner options until he returns. Pray for me I’m gonna try this tonight! May I please have your recipe for the rice? It looks delicious. Hi Crystal, thank you for this recipe link. This rice looks delicious I will definitely be making it. I made your chicken with Sazon and Adobo, and it was delicious. My husband loved it too. And so simple. Next time I will make it with your rice. So thank you for this recipe also. I know that this is an old recipe you posted, however, I wanted to say thank you! I have made it many times and it is delicious! Yay!! Glad you like it!